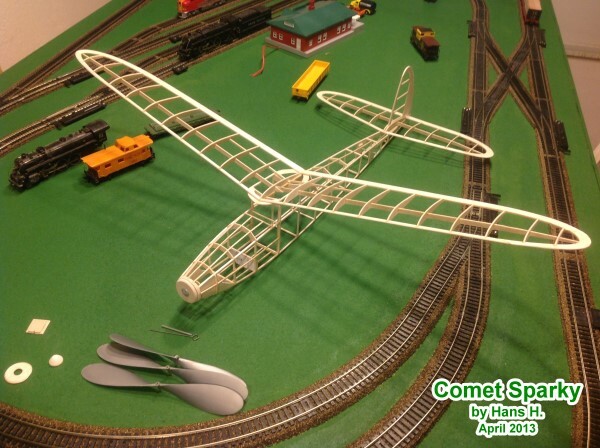 The Comet Sparky was the second stick and tissue free flight model airplane that Philip and I built. His first was the Comet Cadet. 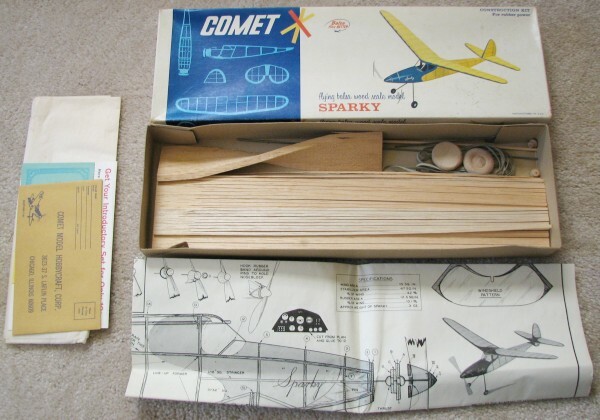 The Comet Sparky was (and still is) an excellent flyer. Rather than carving the balsa propeller blank, I purchased a 9-1/2" plastic propeller from Peck-Polymers. Four strands of 1/8" tan rubber was used for power. 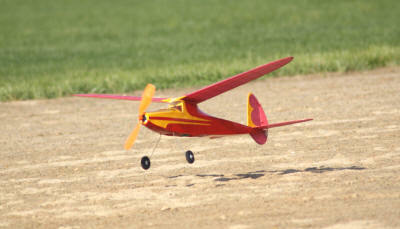 The flights are very nice, with about 45 seconds of slow propeller drive and then a minute or more of glide. It has been adjusted for a shallow climb in a fairly tight circle, and then a glide in the same direction. The flying areas in the area were not huge, and we were not taking any chances of having it fly away. 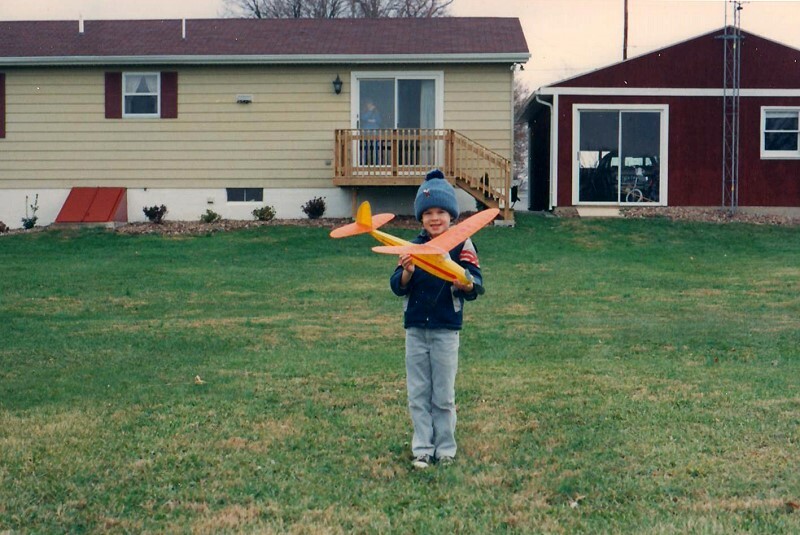 The photograph to the right shows Philip Blattenberger (my son) holding his Comet Sparky, and Sally Blattenberger (my daughter) holding her J-5. Sparky frame built from plans (below) by Hans H.
Website visitor Graham Mobley built his Sparky off of these plans and sent these two photos. I took the sheet templates you attached first built an original Sparky. I already had plans. Next, my son suggested I build another Sparky big enough to use his electric motor and three channel receiver. I scaled everything up by 150%. The 3/16 square balsa used for the fuselage was scaled to 1/8 square (not exactly 1.5:1 but good enough). In order to keep the airfoil true to Clark-Y, I installed sub ribs between the main ones and used the same thickness of tissue that is called for on reg. Sparky. I mounted the batteries just under the trailing edge to maintain correct CG. 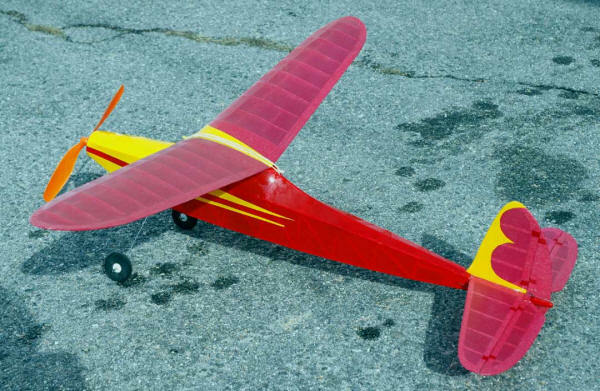 I left the horizontal stab the lifting airfoil just like original Sparky. I cut the stab 2/3 back from the leading edge and fashioned an elevator. The motor was mounted directly to the front nose block. Enclosed are pictures taken in Feb 2010. Sometime around November of 2008, I began removing the tissue from my Sparky because it had become extremely brittle from being stored in my North Carolina attic for many years. The structure was still in excellent condition. My motivation for the resurrection was primarily a desire to try installing a micro radio system for controlling the rudder. The receiver and coil actuator was removed from an Estes Sky Ranger mode that was purchased at Radio Shack for $15. The Sky Ranger has a small electric motor for the propeller, and a fin/rudder mounted actuator. Since the plan is to keep the the Sparky as rubber powered, I cut out the motor wiring in order to save weight. 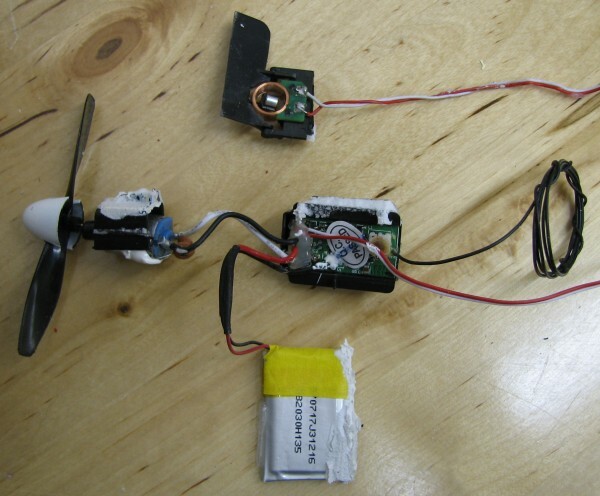 A 3.7 V, 350 mAh Li-Po battery came with the system, but is overkill for powering only the rudder. I will use a 3 V coin cell if possible to save weight. 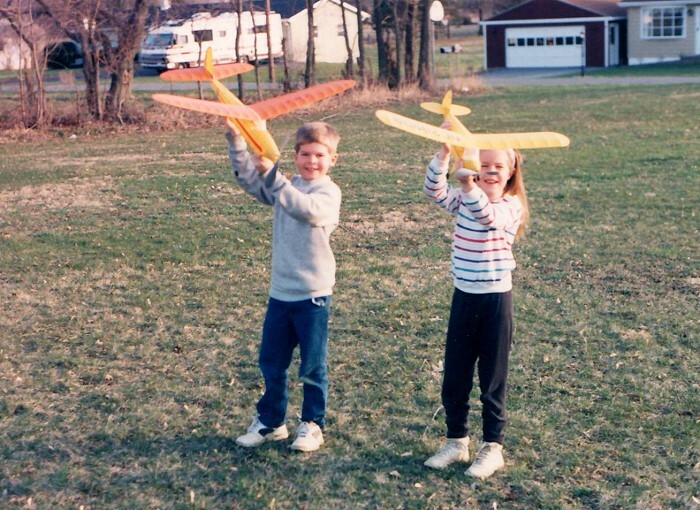 The possibility of free flight models flying away or into danger has always kept me from taking them to their extreme performance capabilities. A dethermalizer setup is a possible alternative, but I like watching the airplanes gliding down to a smooth landing after a flight. 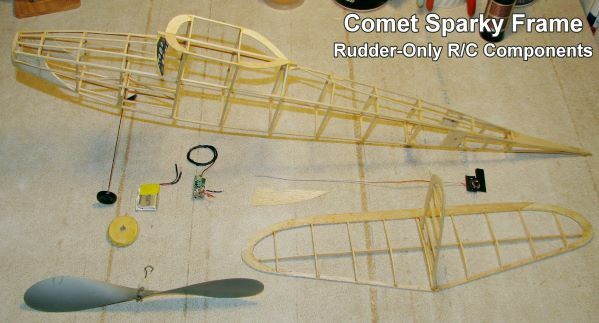 The role of the rudder control will be primarily for keeping the Sparky out of danger, not for flying it around like a radio-controlled airplane. An ideal flight would be one with a fully wound motor, a nice circling climb-out, and then a graceful glide back to Earth, without any rudder control being necessary. Once the installation is complete, I will publish weight and performance information, along with a YouTube video. These photos show the Sparky while being re-covered. Here you can see the tissue paper conduit in the rear floor of the fuselage for routing the rudder actuator wires while protecting them from the rubber motor. To the left are the airborne components removed from an Estes Air Ranger that I bought at Radio Shack. The motor/prop assembly has been removed, as has the 350 mAh LiPo battery. The weight of remaining components is around 0.2 oz. The photos at the right show the installation of the rudder actuator coil, the receiver, and the 70 mAh, 23.7 V Li-Po battery. There is a tiny SPST switch mounted through the windshield, on the left side of the plane. 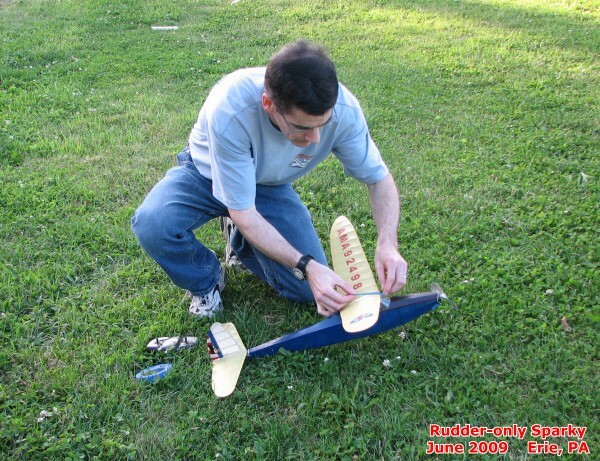 The maiden flight of the Sparky occurred on June 22, 2009, in a local Erie elementary schoolyard. All I had on-hand was some 3/16" tan rubber (original FAI stuff from about 15 years ago), and the four strands was nowhere near enough power. 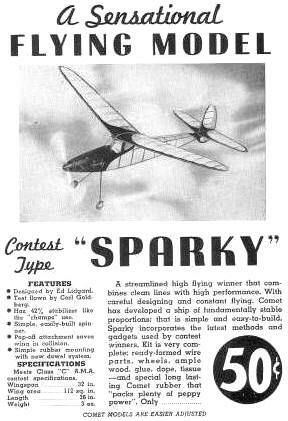 The original Sparky was powered by 6 strands of 1/4" tan rubber, and would climb nearly vertical at launch. With 100 or so turns, the Sparky reached an altitude of about 10 feet and make one full circle to the left before landing uneventfully. 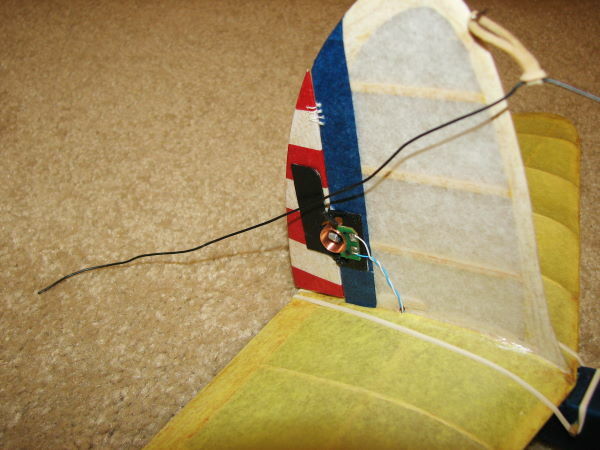 The rudder control was barely noticeable, which was expected since the rudder area is very and control throw are both very small. As mentioned earlier, the purpose was to provide a means of moving the craft out of harm's way, not to be able to steer it through the air in a specific pattern. I removed about 1/16 ounce of weight from the nose (began with 1/4 ounce), wound in 150 turns, and launched again. This time the Sparky climbed a bit higher, and was airborne long enough to test the rudder control some more. Cranking in right stick would change the flight path to nearly straight from its preferred left turn, and cranking in left stick noticeably tightened the radius to the left. Is seems clear that with some time trimming and a few strands of 1/4" rubber, the Sparky will fly as planned. 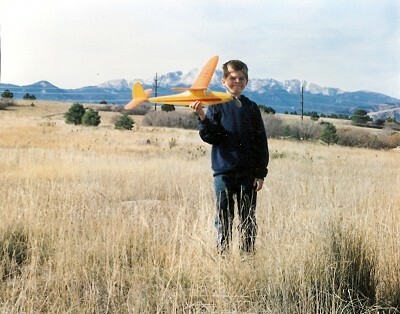 To the left, I'm getting ready to give the Sparky its maiden flight with its rudder-only radio control setup. Only about 100 turns were put on the rubber for this flight. A short video of the flight is embedded below. 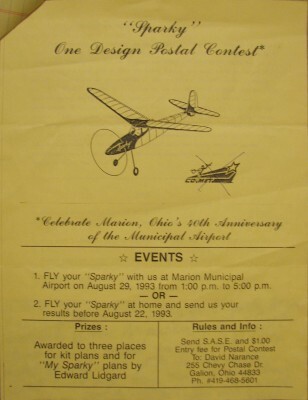 I don't remember where I found out about it - probably in Model Aviation - but the Marion Airfoils, in Ohio, held a mail-in Sparky contest where contestants made a certain number of flights and mailed in their flight times. 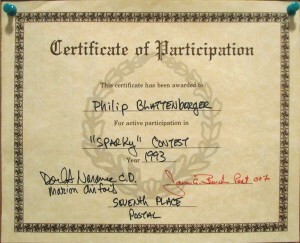 Philip's Sparky took seventh place (out of 30). It was fun, and they sent us a nice certificate (to the right) and a rather lengthy hand-written letter from the CD (contest director), Mr. David Narance. 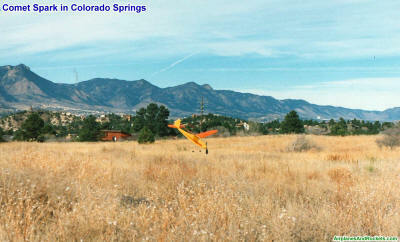 These two photos were taken in Colorado Springs, Colorado, sometime around 1994. 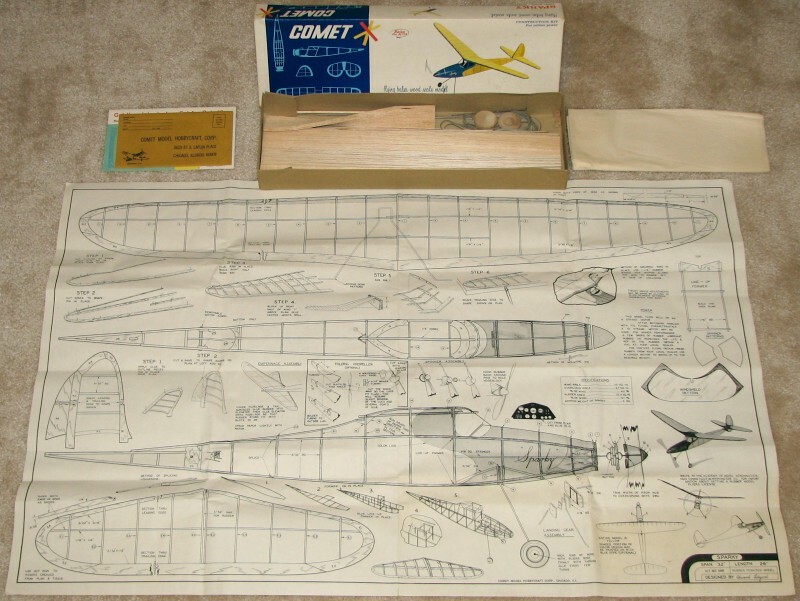 Below is a photograph of my unbuilt Comet Sparky kit. Please send me an e-mail an I will send them to you at no charge. I have one JPG file that is 9,770 pixels wide and is 9.3 MB in size, and the other is 5,000 pixels wide that is 2.9 MB in size. Please make sure that your e-mail inbox can handle the file prior to writing. The plans sheet is made up of 12 individual scans meticulously stitched together in a graphics editor. Total work time was about 4 hours. Note down by the title box is a scale indicator as measured off the original plans. The larger file is at 300 dpi, which will create a printed page of around 33 inches, and the smaller file is about half that. 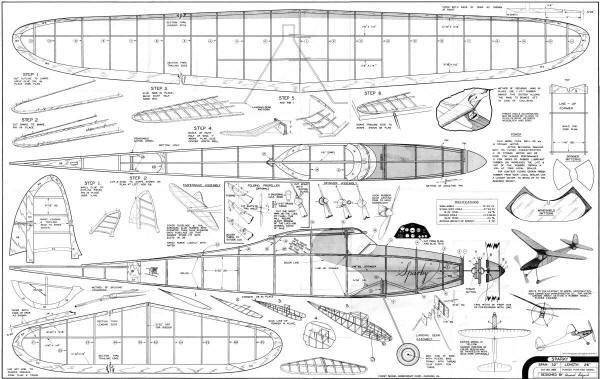 I also scanned the printed balsa parts sheets. All copyrights (if any) are hereby acknowledged. I do not expect and will not accept payment - this is purely a humanitarian service for the modeler who is desperate for plans for this magnificent airplane. Thanks to Airplanes and Rockets visitor Andy K. for providing the sub-rudder portion of the plans. Printwood patterns for balsa sheets are available as well. NOTE: Although not shown on the plans, the center of gravity for the Sparky is around 75% back from the leading edge. This is due to the lifting horizontal stabilizer, which exerts an aerodynamic downward force on the nose in lieu of static weight. Click here to read about how to transfer these printwood templates to your balsa using Avery label sheets. NOTE: Printed plans can be purchased from Bob Holman Plans Service. At the time of this writing, the plans cost $8, and there is a laser-cut parts kit for $18 (+shipping). 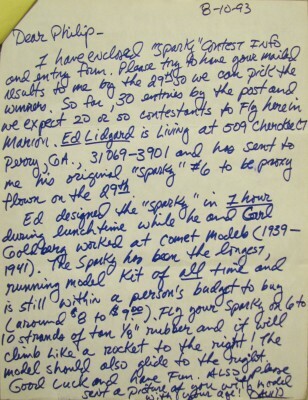 Mr. Paul D. wrote to request plans and printwood patterns. 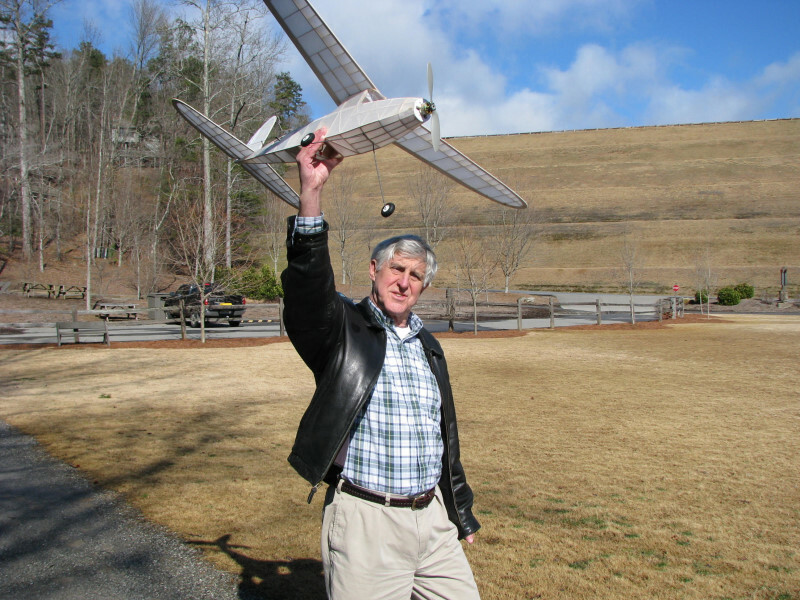 He printed out the plans at 110% to create this 3-channel R/C electric Sparky. Paul was kind enough to send some photos of his masterpiece (click on them for larger versions). Two, 5 gram Tower Pro servos. Electrifly 305MA 2 cell lipo. Motor and controller are unknown, they came out of a T-6 so I know I should have enough power. Prop will be a 10x4 GWS cut down to 9x4. I wanted the wider blade for the lower RPM. Here is his build thread on the WattFlyer.com website - lots of detailed photos definitely worth reading. Paul describes a slick method for transferring the printwood patterns to the balsa sheets that saves a lot of time. I've been flying my Sparky quite a bit and I thought I'd fill you in. I had to change power plants. I change to this one. EC 28PS with an ElectriFly 8A ESC. Still too much power. I'm going to try a smaller motor next. The plane will go absolutely vertical, at least for a few seconds before it's too high to see. I got the weight down to just under 7 ounces and it flies and floats well. The extra weight is welcomed, it penetrates the wind very, very well. I'm running a two cell 900Mah lipo and it's more than adequate for 20 minute flights. 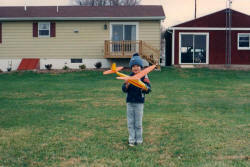 I land when I get tired, I have not lasted until it ran out of battery. 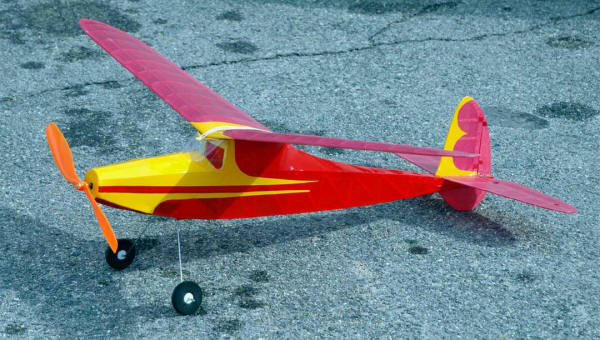 If you are planning on flying this on R/C make the rudder larger; it's barely adequate. If the motor is off, it's not adequate, it actually needs a little power to turn. I knew this would be nose heavy so when I built the plane I didn't use the lifting stab. My plane balances at about 30%. I had to add weight to the rear of the plane because the elevator wasn't effective enough. 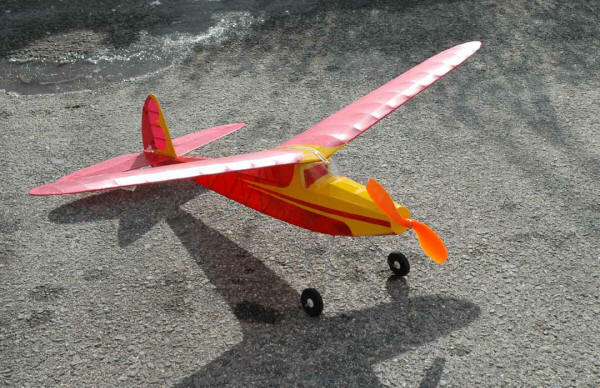 With the tail weight it flies great, I'm having a lot of fun with it. A lot of people still ask, " what is it", usually followed by where can I get one. I steer them to your post. Is This a Cool Landing Photo Or What? Here is an old Comet Sparky magazine advertisement that I found.